I got up at 3 a.m. this morning to get things ready and finished for the Christmas slog, so I’m a little punchy today. There’s a lot of planning, getting, sorting, wrapping, hauling and too much detail for a guy like me to get through the holiday season. And the result is the antithesis of perfect Martha Stewart charm. More like Sanford and Sons junkyard. I really do want to do nice things for my relatives and friends, but the family dynamic I have to deal with focuses on giving gifts. What I end up giving always falls short in my mind, because what I get for them doesn’t convey the message I want to send to them, and to the world in general. Don’t get me wrong. Stuff is nice. I like stuff. But…. if only I could have the power to remake Christmas, to not give stuff, not zap myself silly in a tangle of shorted out holiday lights, not listen to canned carols that are so sticky sweet you go into a diabetic coma hearing them over and over and over….. again. What I’d really like to give is companionship, a shoulder to cry on, a laugh. A lot of laughs, really. Isn’t that the most fun gift you can give? Or if I have to give stuff, I want to give it to somebody who doesn’t have enough stuff to get by. We all pay lip service to the desires to be charitable, and stay in the alleged spirit of the season. But the siren songs of Wal-Mart, Hasbro and Ikea are too strong. It’s almost a law. We have to give stuff. I want that law repealed. And so what if that makes me Scrooge? Mooch the Cat wants to give his best friend, Earl the dog, something great for his special day. Mooch knows that Earl has everything he needs, so what to get him? Mooch decides to give Earl nothing. Nothing, that is, but his undying friendship. It turns out to be the perfect gift. If you must give somebody something, give him or her that book. 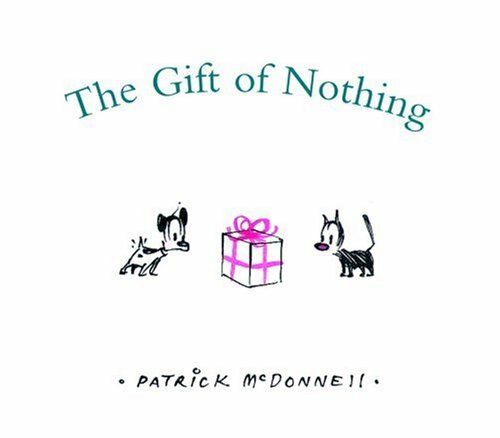 “The Gift of Nothing” sits on a table in my bedroom, in a spot that I can’t help but see every day. It’s a welcome, daily reminder of my gratitude for having great friends, gratitude especially to the person who gave me the book. He’s really got my back. Friendship is the best gift anybody can give. It’s all that I really need. And it’s probably all you your loved ones need, too. This is a preachy, maudlin post, granted. And if the shopping mall resents me for dissing their American Girl dolls, flat screen TVs and iPods, sue me. What I really want to say is have a truly merry Christmas, and I hope you give and receive exactly what you want. This entry was posted on December 24, 2009 at 4:00 pm and is filed under Uncategorized. You can follow any responses to this entry through the RSS 2.0 feed. You can leave a response, or trackback from your own site. what a poignant post. i loved it. Merry Christmas Denis, and thanks!